This weekend on July 4th, the United States celebrates its independence. There are pool parties, picnics, concerts in the park, fireworks and most importantly, food! Perhaps the most ubiquitous food on the fourth is the hotdog. Chicago-style, New York-style or just backyard cookout style, the hotdog takes the spotlight. And we aren’t content with eating just one hotdog, we have entire eating contests. Today, we’re bringing you a delicious recipe for a hotdog dish that you can serve for Independence Day breakfast, lunch or dinner. First, let’s learn a bit about the history of the hotdog and the eating contests that bring us together during this celebration. 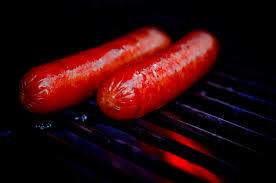 The story of the hot dog begins with the story of the sausage, and the story of the sausage is ancient. Historians believe the first sausage was made during the reign of the Roman Emperor Nero (54-68 CE), when his cook Gaius discovered the process by accident. It was customary to starve a pig for one week before it was slaughtered and roasted. On one occasion, Gaius noticed that a pig had been roasted, but not cleaned. When he pulled out the intestines, they were empty from the starvation diet and also puffed up from the heat. He realized he could fill them with meats, spices and wheat to make a whole new dish. Thus, the very first sausage was stuffed and linked. Of course, once something was popular in Rome, it generally made its way around the world as the Romans expanded the empire. Sausages took hold in Germany where cooks began making numerous varieties in all shapes and sizes. Eventually, centuries later, the frankfurter was born. There is some dispute over where and when the first frank was actually created. Although its origin is traditionally credited to Frankfurt-am-Main, Germany sometime around 1487, the towns of Coburg and Vienna in Germany have also claimed to be the originators of the dog. Regardless of who actually brought the hot dog into the world, we know it came to the New World with European immigrants who sold them from food carts in big cities. German immigrants in particular helped to make the combination of hot dog and bun popular, thus making the taste sensation we know today and conferring the dog with a new portability. 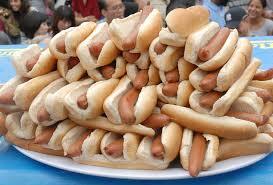 In 1893, hot dogs made their debut in ballparks around the U.S. and became a staple in the world of baseball. As the standard food of America’s favorite pastime, it isn’t surprising that the hot dog quickly became one of America’s favorite snacks. While we have many different modern eating contests, the fourth of July is dominated by one single competition: Nathan’s Famous Hot dog Eating Contest at Coney Island in New York. First held in 1916, in was started according to gastronomic lore when “four immigrants competed to determine who was the most patriotic (the Irishman won with 13).” Who knew that hot dogs were delicious and patriotic? So this weekend, whether you’re joining the masses at Coney Island or having your own contest in the backyard, make sure you grill up some hot dogs and celebrate not only the history of the United States, but also some ancient world history! Click here to get the latest information on the 2015 World-Famous Nathan’s International Hot Dog Eating Contest and to check out the Hall of Famers for the last 42 years. 2. Brush oil onto bottom and up sides of an 8-inch baking dish to thoroughly coat inside dish. Arrange cut-up pieces of hot dog in dish and bake for 5 minutes. 3. In a medium bowl, combine flour, milk, egg and 2 tbsp. water; season with salt and pepper and stir thoroughly. Beat using an electric hand mixer or whisk until mixture is completely smooth. 4. Carefully remove hot dish of hot dogs from oven and pour egg batter on top. Bake for 30 minutes, until puffed and golden brown around edges. Divide into equal portions and serve with warm cheese sauce. This entry was posted in Blog, Bon Appetit Wednesday, Culinary, Culture, Holidays, Public Life and tagged ancient food, ancient history, ancient recipes, AntiquityNOW, Bon Appetit Wednesday, history of eating contests, history of hot dogs, hot dogs, Logi, Loki. Bookmark the permalink.